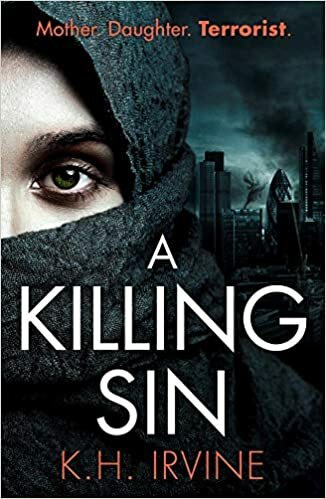 I am over excited to share my review with you for A Killing Sin by K.H. Irvine. It is published on the 4th of July, I was very grateful for my gifted copy from Matthew at Urbane Publications. Would you surrender your secrets to save a life? London. It could be tomorrow. Amala Hackeem, lapsed Muslim tech entrepreneur and controversial comedian, dons a burqa and heads to the women’s group at the Tower Hamlets sharia community. What is she doing there? Ella Russell, a struggling journalist leaves home in pursuit of the story of her life. Desperate for the truth, she is about to learn the true cost of the war on terror. Millie Stephenson, a university professor and expert in radicalisation arrives at Downing Street to brief the Prime Minister and home secretary. Nervous and excited she finds herself at the centre of a nation taken hostage. And then it gets personal. Friends since university, by the end of the day the lives of all three women are changed forever. They will discover if friendship truly can survive secrets and fear. Set in a the not so distant future post Brexit, the UK has changed ever so slightly. When friends Neil and Amala create a band that can help track missing children they become instant billionaires. But the Government may be using the bands in an unorthodox way. We also meet Millie and Ella a journalist and a University Professor and expert in radicalisation. This small group of tight friends find themselves in a dark and time sensitive situation that has extreme consequences to the whole world. I read the book in one sitting, I was immediately taken by the pace of the writing the ease with which it flowed. It is not over filled with unnecessary jargon, Irvine has found a way to make hard hitting topics that often make my head spin (because I honestly don’t understand), flow from the page in such a way that I felt I was learning as I read. The book is perfect for fans of 24 and Homeland, it reads at the same pace as those shows. It has its own beat. Matching my own racing heartbeat at times. This was a refreshing read for me, I haven’t felt such a connection to a book in a very long time. The need for me to keep reading was infectious, I knew if I went to bed I would not sleep. It would be like watching half of an amazing movie and pausing it for the next day. Not happening, as I finished the book I felt emotionally drained and thoroughly satisfied. I had shouted, cried and agonised over the pages. It had become almost part of me, I felt like I had lived this heinous situation with this group of amazing friends. The book is a mix up of genres, political, suspense, thriller, crime fiction all in one beautifully bound publication. Irvine has created such a believable future which in itself is terrifying. Irvine handles the discussion of race and religion with complete respect. You can tell that a lot of research has went into the book. It really makes you stop and think and just maybe change your way of thinking. Just recently in the news here in real life there has been much discussion about letting people back in to the country who left and went to Syria. The book covers such topics and gives an insight into how people are groomed in a way to join different religious groups with the enticement of a safe happy place with people who love you. Lots of love for the cover design too, it is the perfect fit for the book. The book as a whole package, cover, story and writing is top notch and kudos to the Urbane team for bringing it all together so beautifully. Going by the authors notes at the end of the book, it seems K.H Irvine wrote the book as a gift to herself for her 50th Birthday. I hoping that she had written many more books as I want to emerge myself into her writing again and again and again. Having dug a little deeper I am in shock to discover that is in fact a debut novel! This is an EPIC must read, you will go on such a memorable journey with this group of friends. K.H. Irvine has arrived ladies and gentleman, buckle up and pay attention. Pre-order your copy here, don’t forget to come back and let me know your thoughts on the book. I just know when you finish it you will have a need to talk about it. Wow fantastic review! I really like the sound of this one! It’s an amazing read, I honestly loved it. I’ve not read a book in one go in a long time. Great review! I hadn’t heard of this book. It’s out in July, available for preorder. It’s such a great read.